Septic systems alone are unable to process the fats, greases and oils that find their way into plumbing drains. Known as FOG, fats, oils and greases separate from normal wastewater before it reaches the septic system for processing. Installation of a grease trap ahead of the septic tank, or city system, separates FOG through a series of chambers and weirs. Periodically, the FOG is pumped from the grease trap by a septic pumping service. Grease traps remove cooling oils and greases from wastewater that finds its way into sink drains. Locate the septic tank, or main sewer line, in the yard. The septic tank is normally positioned 6 feet or more from the outside wall where the sewer line exits the home. Using a sharp metal rod, probe the ground to identify the exact location of the tank. Remove a section of soil from above the main sewer line, between the outside wall of the home and the septic tank. The section of soil should be twice the diameter of the grease trap. Once the soil above the main line is out of the way, remove soil for installation of the grease trap. Dig a larger hole below the main line for accommodating the grease trap. The depth of the hole should equal the depth of the grease trap from its bottom, to the middle of the inlet connection on the grease trap. The diameter of the hole should equal that of the grease trap diameter, with an additional 1 foot on each side to accommodate hook-up of the tank. Turn on a bathtub faucet or shower, and allow the fresh water to run for approximately 30 minutes. The fresh water will flush the sewer line of waste water. There will be a little fresh water in the sewer line when it is cut and removed, but no special surprises. Measure the distance between the inlet and outlet connections on the grease trap. The measurement between the two is the amount of main sewer line pipe to be removed for installing the grease trap. Transfer the measurement to the sewer line, and mark the section for removal. The section of sewer line to remove should be directly centered above the hole for the grease trap. Cut the main sewer line and remove the section of pipe to accommodate installation of the grease trap. 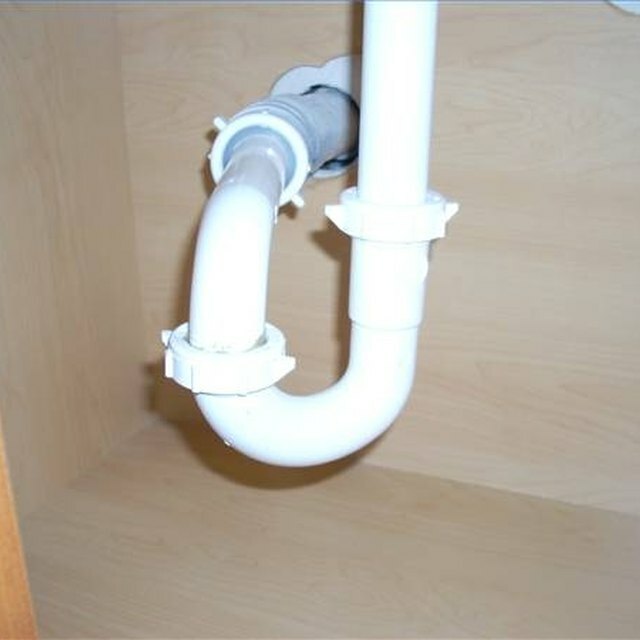 Depending on the type of sewer line--probably PVC--use a hacksaw or reciprocating saw to cut the sewer line. With the section of pipe cut, remove the pipe and set it out of the way. Slip a connection coupling onto each of the two stub-ends of the main sewer line. The connection coupling will hook the main sewer line into the grease trap and seal against leaks. Depending on the type connections found on the grease trap, the exact size and type of connection coupling will vary. The connections should be purchased from the same supply house as the grease trap. Lower the grease trap into the hole for installation. Take notice of the direction of flow indicated on the grease trap. Painted arrows or other markings on the grease trap will indicate the direction wastewater must flow through the grease trap in order for it to work properly. The proper direction of flow must be observed. Line up the grease trap inlet and outlet connections with the main sewer line. Ensure the trap is level by adding or removing soil from beneath the grease trap as needed. With the connection points aligned, slide the connection couplings into place and secure them with the provided clamps and flat-head screwdriver. Turn the water on in the house and allow the grease trap to fill with water. This will also allow to check for leaks around the connection couplings. Once the grease trap is full of water and the inspection for leaks is complete, back-fill the hole around the grease trap with soil. Cover the grease trap with soil and sod to complete the installation. Mark the location of the access cover--or remember its location--for future service when the tank is pumped out. Fill the grease trap with water before using it normally. Pump the septic tank clean before cutting into the main sewer line if the tank is full.